Facebook has released what might be the next best thing for call after True-Caller. The just released mobile application called Hello promises to deliver the same caller identification service to identify your callers even when their phone number is not saved in your contact list. However, Hello from Facebook will be using data from the caller’s Facebook profile to identify the caller. Don’t worry about your privacy because Facebook has assured that it will only share the contact detail that is already public on your Facebook profile and can also block unwanted calls. The app will also give suggestions about commonly blocked numbers. 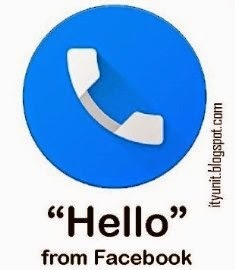 According to an update from the Facebook newsroom, Hello can go beyond calling, “you can also use it to search for people and businesses on Facebook and call them with just one tap”. Recently, Facebook has been introducing innovative products for user as well as enhancing user’s experiences on their platform. Most of the innovations have been delivered by the Messenger Team and this new app, Hello, is reportedly built by the same team. The app is being rolled out for public testing for users in Nigeria, US, Brazil and other selected countries and it is only available on Android for now.